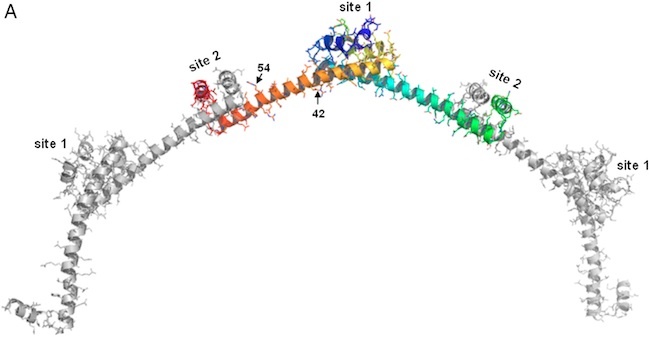 A chain of proteins hold bacterial DNA in a compacted spiral. You and I are eukaryotes. 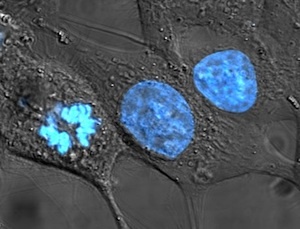 Our cells have nuclei, repositories that contain our DNA and the proteins that read them to produce an RNA copy of them. In earlier articles, I’ve mentioned in passing how the enormous length of DNA in our cells is fitted into a nucleus. Our DNA, all 2 metres of it, were you to stretch it out end-to-end – is fitted within a nucleus with a diameter of roughly 6-10 micrometres, about one-millionth of a metre. The trick is that a DNA molecule is very skinny – it’s only about 2 nanometers wide (2 billionths of a metre wide). Wrap that up around a something handy and it’ll be quite compact. The ‘something handy’ in eukaryotes are histone proteins. Eight histone proteins associate to form a disk-shaped octamer, wrap DNA almost twice around it and you have a structure called a nucleosome. Bacteria don’t have histone proteins. They don’t have nuclei either. Their DNA lies within the ’main’ compartment of their cells (the cytoplasm). Their DNA isn’t as compacted as eukaryotic DNA, as we’ll see soon, but it is compacted. It’s not just floating loose in there. Researchers have previously determined the atomic structure of parts of the H-NS protein from several species of bacteria. With this and a lot of experimental data, they’ve tried to figure out how it compacts bacterial DNA without coming up with a definitive answer. Individual H-NS proteins bind together to form larger structures made of many H-NS proteins with the bacterial DNA attached to them. What’s needed is knowing how these proteins associate to form the larger complexes than bind the bacterial DNA. Proteins are often made of several modules, or domains, each contributing a different part of the function of the protein. 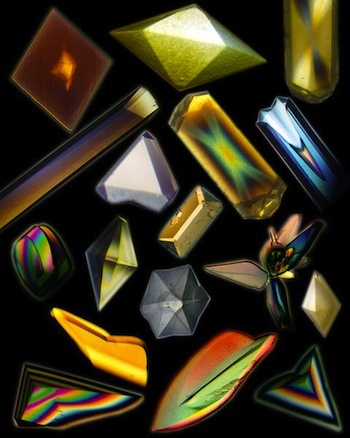 It can be hard to make large amounts of pure proteins, or to crystallise them. Often instead of trying the whole protein, researchers will try just a single domain of a protein, or to leave out some bits in the hope of being able to grow a crystal. 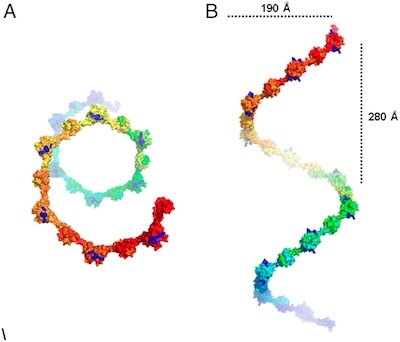 Using molecular modelling, they built models of how these dimers (shown above) might associate with each-other to form a continuous scaffold that DNA could attach onto (next three figures below). Each dimer, two-mer of H-NS proteins, form not side by side facing the same way (parallel symmetrical dimers), but end-to-end from opposite directions ’anti-parallel’ to each other. Chaining these together like a daisy chain forms a long connected chain of proteins. If you think of the proteins as having a ‘head’ and a ‘tail’, two tails associate from opposite directions (‘Site 1’), then two heads associate (‘Site 2’), then two tails, and so on, to form a continuous series of proteins packed against eachother. 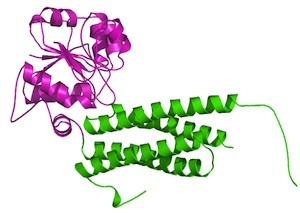 The proteins in Arold and colleagues’ crystals don’t include the DNA-binding domain, but other groups have worked out what the DNA-binding domain looks like. When the DNA-binding domains are placed on to their model of the spiral, they appear in regular steps on both sides of the spiral (figure above). Bacterial DNA is a circle. 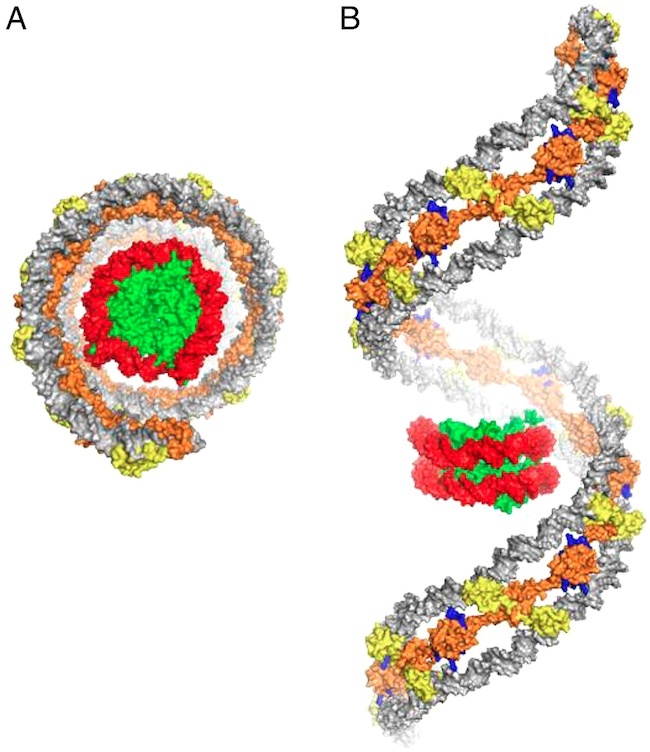 For two DNA molecules to be bridged by this scaffold, they ought to be a circle folded into a spiral with the two adjacent DNA molecules running in opposite directions. Thus is model nicely explains what is seen in experimental studies an electron micrographs of prokaryotic (bacterial) DNA. Great article, but found a mistake: “6-10 micrometres, about one-hundredth of a metre”. Second paragraph. I feel some crochet coming on…. Great post – with some lovely illustrations. I like histone-like proteins, they help to show that despite being a lot smaller and thought of as ‘simpler’ bacteria have similar problems to solve as eukaryotes do. By the way, I don’t know if you’ve done this already, but this would be a great post to submit to the MolBio carnival: http://bit.ly/bjdFTn We’re looking for submissions for the next edition on September 6th. Thanks for the kind thoughts – I missed carnival that last time around. My only concern is that this article was really intended for those that don’t know molecular biology; those that do might find it is a little ‘lite’, even patronising – ? But if you think it’s appropriate, sure! I have a couple of older posts that might be possibilities, too.